Can you tell us something more about you and your work? I was born in the East End of London and am of mixed heritage. My Mum is white British and my Dad is from Trinidad in the Caribbean and is mixed Black, Brazilian and Chinese so I’m kind of from all over. I think growing up my mum always knew I was going to be a performer, I was an only child and would spend a lot of my time in my own little world playing by myself for hours and was constantly putting on shows, she didn’t really have a choice to be honest ha. I graduated from The Urdang Academy in 2016 and my first job was in the Edward Albee play “The Goat or who is Sylvia” at the Theatre Royal Haymarket. I was so lucky to work alongside and learn my craft from Damien Lewis and Sophie Okonedo as well as our director (the man, the legend) Ian Rickson . I also recently finished work on the Second Mamma Mia film which I had the best time on, I think that comes out late summer this year. 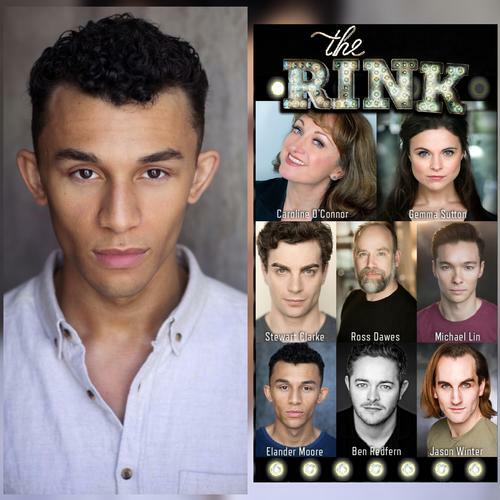 You are in the cast of The rink, opening soon at Southwark playhouse. Can you tell us about this production? The Rink is one of Kander and Ebs Lesser known musicals but man does it feel current and relevant right now! Its set in an old run down roller rink on Coney Island in New York and follows the story of a Mother and daughter (played by the amazing duo Caroline o’Connor and Gemma Sutton) attempting to rekindle their relationship and heal the riffs between them, raising the ghosts of the past in the process. I love the show not only because it’s a piece about strong women and their mistreatment by troubled men, but I also think it was written way before its time, the plot almost feels like a Netflix series in places, moving backwards and forwards through time in a series of flashbacks. We’re having a great time in rehearsals! I love being part of this incredible cast and creative team breathing new life into what I think is a seriously overlooked piece of musical theatre. What kind of theatre do you like? Have you seen any show that you particularly liked recently? Once I finished School and learned how tough this industry can be I realised the first and most important thing was to go and see as much theatre as I could. I practically lived at the Royal Court and National Theatre in my first 4 months of unemployment and spent nearly all my money (which wasn’t much) in the theatre. Both Sheila Atim’s and Shirley Henderson’s performances in Girl from the North Country at the Old Vic. It seems to be such a great time for theatre in the UK right now! So much great work going on. I would however love to see more new British musical theatre writing, especially stories from a wider range of backgrounds and social classes. I think were really behind America in terms of new musical theatre and yet we have so many diverse and incredible stories practically begging to be told right here! I hope I can be a part of that young generation moving musical theatre forward over here and I really hope to tackle the stigma some people have around the idea that Musicals aren’t for “serious actors.” Anyone who saw Imelda Staunton performance in Gypsy last year might disagree…. ….Quick tip to any theatre lovers wanting to see good shows on a budget. Go alone to the box office an hour/ half an hour before the show and give them a nice cheeky smile and you can nearly always get a returns or cheap ticket! Has worked nearly every time for me, just be extra nice! Thank you Elander. You must have a very cheeky smile, because mine never worked. Good luck for The Rink!